Cotoneaster is a genus of shrubs (occassionally small trees) native to the Palaearctic, but also present in other temperate areas as represented by weed species. As shown pretty well in the photo of a Cotoneaster frigidus specimen above (from Wikipedia), Cotoneaster is part of the Rosaceae and closely related to such genera as Crataegus (hawthorns) and Pyracantha (firethorns). 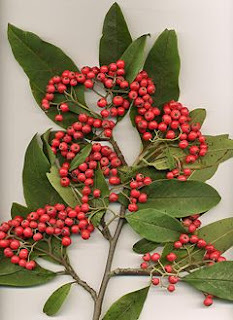 Depending on how you look at it, Cotoneaster is a smallish genus or a rather large genus. The problem is that a number of polyploid lines of Cotoneaster are avid indulgers in apomixis, the asexual production of seed (plant parthenogenesis). The resulting shortage of genetic recombination means that there is almost no theoretical limit to how minutely the 'species' can be divided, and a whole host of 'microspecies' of perhaps dubious practicality potentially can be (and often have been) identified. The situation is even further complicated in many plants such as Cotoneaster that are not obligate apomicts - Cotoneaster flowers remain attractive to wasps, and a very low level of sexual reproduction may still occur. Most authors, though, continue to define their Cotoneaster 'species' fairly broadly, in a victory for pragmatism over precision. Please consider submitting a post to Berry Go Round, A Plant’s Carnival!